F. excelsior is affected by dieback in the major part of its natural geographical range in Europe, which results in economic and ecological losses. The disease is caused by the ascomycetous fungus Hymenoscyphus fraxineus, a pathogen introduced to Europe most probably from East Asia. This paper presents data on fungi identified on F. excelsior trees representing two different stages of ash dieback in Poland. Fungal communities were identified in initial necrotic lesions on living stems and twigs using the classical method of isolation on malt extract agar and morphological and molecular analyses. In dead apical parts of stems and twigs, fungi were identified by microscopic analyses of fruit bodies formed in situ. Seventy-one fungal taxa were found in 720 samples with symptoms of initial or advanced necrosis. The most common fungus detected in initial necrotic lesions in each forest site was Hymenoscyphus fraxineus (59.2 % of analysed samples). Other frequently isolated fungi included Alternaria alternata, Diaporthe eres, Diplodia mutila, Fusarium avenaceum, F. lateritium and Phomopsis spp. Fruit bodies on dead apical parts of stems and twigs were produced mostly by Diaporthe eres, Diplodia mutila, Lophiostoma corticola, Phomopsis spp., Sirodothis sp. and Valsa cypri. Fungal communities from different sites were similar, as shown by high Sørensen similarity index values. Greatest variation in fungal community structure at the initial necrotic stage was realized by D. mutila and F. avenaceum, and at the advanced necrotic stage by D. eres, D. mutila and Phomopsis spp. Data show a close affinity of certain fungi to site, suggesting geographical relatedness. The ecological effects of distribution of the invasive H. fraxineus and of other fungi sporulating on diseased ash trees in Europe are discussed. Fraxinus excelsior is the most widely distributed native ash species in Europe (Wardle 1961; Wallander 2008; Dobrowolska et al. 2011; Clark 2013). Its successful expansion resulted mainly from anthropogenic factors and heterogeneous environmental conditions. It may also have benefited from some ecophysiological attributes that made it less susceptible than many other broadleaved tree species to attack over large areas by dangerous pests and pathogens (Wardle 1961; Marigo et al. 2000; Amar et al. 2010; Chen 2012; Pautasso et al. 2013; Gross et al. 2014). The situation has changed, however, in the last 20 years since the early 1990s large-scale dieback of F. excelsior has been found and observed increasingly in Poland and Lithuania (Kowalski 2001; Przybył 2002; Lygis et al. 2005). Subsequently, F. excelsior dieback spread towards south, west and northern Europe and has reached epidemic level in most European countries, including Great Britain where it was first observed in 2012 (Husson et al. 2011; Timmerman et al. 2011; Pautasso et al. 2013; Gross et al. 2014). Studies on the causal agent of F. excelsior dieback took place over a few years. First, the genus Chalara was reported as the causal agent of disease and its microscopic features were presented (Kowalski 2001). The fungus was described as a new anamorphic ascomycetous species, Chalara fraxinea (Kowalski 2006). Its teleomorph, based on morphological features, was initially designated as Hymenoscyphus albidus (Kowalski and Holdenrieder 2009a). Further research based on DNA sequences of isolates from Switzerland and other European countries revealed that H. albidus represents an aggregate of two clearly delimited species (Queloz et al. 2011). One was related to the non-pathogenic H. albidus sensu stricto, which had been known in Europe since 1850 (Kowalski and Holdenrieder 2009a; Baral and Bemmann 2014). The second was described as a new cryptic species, Hymenoscyphus pseudoalbidus, with Ch. fraxinea as its anamorph (Queloz et al. 2011). A new taxonomic designation was made by Baral et al. (2014), who stated that under the rules for the naming of fungi with pleomorphic life cycles, adopted in July 2011 (Hawksworth 2014), the nomenclaturally correct name for the fungus causing the current ash dieback in Europe is Hymenoscyphus fraxineus with the basionym Chalara fraxinea, and Hymenoscyphus pseudoalbidus as a taxonomic synonym of H. fraxineus. Ash trees are infected by wind-dispersed ascospores of H. fraxineus produced in summer in apothecia on old leaf debris from the previous year and sporadically at the base of seedling stems (Kowalski et al. 2010; Kirisits et al. 2012; Gross et al. 2014; Kraj and Kowalski 2014). Disease symptoms include necrotic lesions on leaves, twigs and branches and sporadically on stem bases and roots, followed by wilting and premature shedding of leaves and dieback of tips, whole twigs and branches (Kowalski 2001; Chandelier et al. 2010; Schumacher et al. 2010; Gross et al. 2014). The disease affects trees of all ages. Disease progress is, however, slower in older than in younger trees (Kowalski and Czekaj 2010; Skovsgaard et al. 2010; McKinney et al. 2011; Kirisits and Freinschlag 2012). Ultimately, the disease leads to the death of single trees and whole stands, which has consequences to the survival and distribution of F. excelsior in Europe (Pautasso et al. 2013). The previous studies showed that shoots of declining ash in Poland are colonized, in addition to H. fraxineus, by other species of fungi, like generally in every diseased and symptomatic plant tissue (Kowalski 2001, 2006; Przybył 2002; Kowalski and Łukomska 2005; Kowalski and Holdenrieder 2008; Gross et al. 2014). Further systematic mycological analyses are being made in Poland for recognition of the fungal communities in symptomatic stems and twigs of F. excelsior trees at different stages of disease progress. Recognition of the structure of fungal communities in initial necrotic lesions on stems and twigs was the first objective of this study. Such analysis was expected to: (1) determine the frequency of H. fraxineus as the potential primary causal agent of F. excelsior dieback; (2) identify fungal species that benefit from earlier, primary infection by H. fraxineus or initially colonize the tissue independently and cause lesions similar to those of H. fraxineus; and (3) create the basis for studies on interactions between H. fraxineus and other fungal colonizers that contribute to progress of necrosis and disease (Bengtsson et al. 2014). Relationships between host and fungi are particularly important in relation to global warming, with consequences for host and pathogen physiology, reproduction, survival, spatial and temporal distribution, resource availability and competition (Clark 2013). Another important objective was the detection and identification of fungi that form fruit bodies on the dead parts of stems and twigs. Since fruit bodies are the main reservoir of inoculum, dead tissues might represent a risk for the health of F. excelsior and other tree species, particularly if diseased or dead trees are left for nutrient cycling and sustainable development of the forest (Lassauce et al. 2011; Pautasso et al. 2013). Recognition of the form and intensity of fructification and sporulation may help to create environmentally appropriate, and suitable management practices in tree stands with F. excelsior. To characterize the fungal community, numerous samples originating from several sites of Poland, where F. excelsior showed dieback symptoms, were examined. 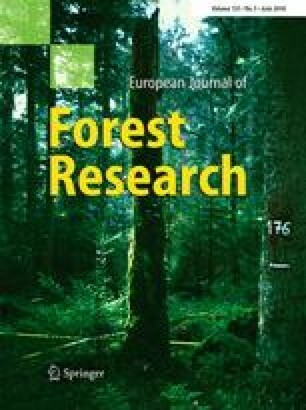 The research covers a continuous 6-year period of investigation and so must be considered as unique in fungal community studies on European ash. The study began soon after the first description of the fungus Chalara fraxinea as the main causal agent of ash dieback (Kowalski 2006). Study material was collected in six forest sites (five forest districts and one national park). Five of the sites were in southern and one in northern Poland (Fig. 1). At each site, four separate groups of young F. excelsior trees, 1–3 m high, with dieback symptoms, within a radius of 5 km, were chosen at random. The ash was growing mostly under mixed stands including fresh, mixed fresh or wet deciduous forests or alder-ash wet forest, and less often in open areas. Average annual temperature, average annual precipitation and the height of sites above mean sea level are given in Table 1. One 40-cm-long section of stem or twig, with visible external initial necrotic lesion, was collected from each of 15 living ash trees in each of the four plots at each site based on a single sampling in June 2007–2012 (Tables 2, 3). The necrotic lesions on the sample material were typical of H. fraxineus infection; they were lens-shaped and located on stems and twigs at the base of dead side shoots and sporadically around buds (Kowalski and Holdenrieder 2008, 2009b). The bark was evenly light brown or light brown stained with dark strips, rarely evenly dark brown, with no fruit bodies. Sporadically, necrosis was accompanied by leaf wilt in the distal parts of the tree. The lens-shaped lesions, which were sunken in comparison with the surrounding tissues of the living stems, suggesting their long-term development, were not included in the study (Kowalski and Holdenrieder 2008). Cyphellophora sessilis (de Hoog) Réblová & Unter. Mollisia cf. cinerea (Batsch) P. Karst. At the same forest sites, in each of four plots of each site, within the period of August–September 2007–2012, the dead apical part of the main stem or twig (24–142 cm long) was collected once from each of 15 living but symptomatic ashes (Tables 2, 4). The bark on most samples was still uniformly attached to the wood. Areas with possible initial necrosis of bark, resulting from typical infection by H. fraxineus followed by girdling of stems or twigs, were observed on 80 % of samples. Bark in those areas was discoloured, sunken and cracked, with longitudinal scratches. Such symptoms were absent on the remaining 20 % of samples, particularly where they had necrotic bark that was broken or peeling, often exposing the wood or contributing to canker formation. Fungal fruit bodies were often present on the bark surface. The samples were placed separately in plastic bags and brought to the laboratory for analysis. Sixty samples of each type were collected from each forest site, 80 % of which originated from main stems and 20 % from twigs. A total 720 samples of both types were analysed (Tables 2, 3, 4). Fungal isolations from initial necrotic lesions were performed within 24–72 h from collection of samples, which were stored meanwhile at 4 °C. Stem or twig sections with necrotic lesions were surface-sterilized by soaking first for 1 min in 96 % ethanol, then for 5 min in a solution of sodium hypochlorite (approx. 4 % available chlorine) and finally for 30 s in 96 % ethanol. After drying in layers of blotting paper and removal of superficial tissue, six pieces consisting of inner bark and wood tissue (5 × 2 × 2 mm) were cut out and placed on the surface of malt extract agar (MEA; 20 g l−1 malt extract (Difco; Sparks, MD, USA), 15 g l−1 agar Difco supplemented with 100 mg l−1 streptomycin sulphate) in Petri dishes (diam. 9 cm). In total, isolations were made from 2160 pieces from 360 necrotic lesions (Table 2). The incubation took place at 20 °C in darkness. All Petri dishes were examined every 3–7 days for at least 6 weeks. Different fungal taxa detected on different tissue pieces on the same agar plate were isolated and re-grown on new agar plates. All isolated fungi were grouped into morphotypes. Morphotypes were identified on the basis of culture structure, sporulation and comparison with the collection of standard morphotypes deposited at the Department of Forest Pathology, Mycology and Tree Physiology, University of Agriculture in Kraków, Poland. In addition, one of each morphotype was identified by molecular means. Therefore, total genomic DNA was extracted from mycelium using the Genomic Mini AX Plant (A & A Biotechnology, Gdańsk, Poland) following the manufacturer’s instructions. DNA samples were dissolved in TE buffer (10 mM Tris–HCl, 1 mM EDTA) to get a concentration of 10 ng μl−1 and stored at −20 °C. The ITS 1/2 rDNA was amplified by PCR with the use of ITS 1F (5′ CTT GGT CAT TTA GAG GAA GTA A) and ITS 4 (5′ TCC TCC GCT TAT TGA TAT GC) primers (White et al. 1990; Gardes and Bruns 1993). The 50 µl PCR mixture consisted of PCR buffer, 2 mM MgCl2, 0.2 mM deoxyribonucleoside triphosphates (dNTPs, MBI Fermentas, Burlington, Canada), 1 μM of each primer, 1 U of Dream Taq Green polymerase (MBI Fermentas, Burlington, Canada) and 50 ng of DNA. Cycling conditions were: an initial denaturation at 95 °C for 5 min, followed by 36 cycles of denaturation at 95 °C for 1 min, annealing at 56 °C for 45 s and elongation at 72 °C for 3 min, and a final extension at 72 °C for 8 min. For fungi that were not amplified with ITS 1F, primers ITS 1 (5′ TCC GTA GGT GAA CCT GCG G) (White et al. 1990) and ITS 4 were used (Table 2), and the annealing temperature was changed to 51 °C. The PCR products were checked by electrophoresis of 5 µl of product in 1.5 % agarose gel containing fluorescent Midori Green DNA Stain (Nippon Genetics Co. Ltd, Tokyo, Japan). PCR products were purified using the MinElute PCR purification kit (Qiagen, Crawley, UK). DNA was sequenced using the BigDye1 Terminator v3.1 Cycle Sequencing Kit (AB Applied Biosystems, Foster City, CA 94404, USA) and primers ITS 1F or ITS 1. The purified products were run at the DNA sequencing facility of Macrogen Europe (Amsterdam, the Netherlands). Sequences were identified by comparison with reference sequences in NCBI GenBank using Geneious 6.1.8 software (Biomatters, Auckland, New Zealand) (Kearse et al. 2012) and BLAST (Basic Local Alignment Search Tool, Altschul et al. 1997). Each sequence was identified to the lowest taxonomic rank possible. Sequences with 97–100 % similarity were identified to species and with 91–97 % similarity to genus (Glen et al. 2001); however, the morphological analyses have been also taken into account. Sequences of representative isolates were deposited in GenBank (Table 2). Identification was made by macro- and microscopic analysis of fruit bodies and sporulation formed on collected samples. For microscopic analysis, hand-cut sections and 1–3 slides were prepared from each fruit body. Observations were made with a Zeiss V12 Discovery stereomicroscope (Zeiss, Göttingen, Germany), and with a Zeiss Axiophot light microscope using differential interference contrast (DIC) illumination and an AxioCam MRc5 and HR3 cameras. Fungi were classified and identified to the lowest taxonomic rank on the basis of anatomical and morphological features using the mycological keys or monographs (Grove 1935; Ellis 1971; Domsch et al. 1980; Sutton 1980; Sivanesan 1984; Ellis and Ellis 1985; Spielman 1985; Uecker 1988; Boerema et al. 2004; de Gruyter et al. 2010). The occurrence frequency of an individual taxon was expressed as the percentage of colonized samples (Tables 2, 3, 4). Sørensen similarity indices (Magurran 1988) were used to compare the total fungal communities from different forest sites as well as between initial necrotic lesions and dead tops of stems. The exploration of multivariate structure of contingency (frequency) table was done using correspondence analysis (CA) implemented in package Statistica 10 (Statsoft Inc. 2011). CA technique analyse frequency data and construct directions in the space that explain inertia (a total Pearson Chi-square divided by the total number of observations). The calculation of the Chi-square value requires the condition fulfilment of minimum number of observations, which have been done as the result of the adoption of the 5 % frequency threshold (Tables 3, 4). The structure of objects was presented in standardized coordinate system which make easier to recognize the relationship between the forest site (variables) and fungal taxa (cases) (Figs. 2, 3). There were 48 fungal taxa identified, represented by 2074 fungal isolates from 360 samples of initial necrotic lesions. Sixteen fungal taxa were found in only one sample (Table 2). The number of fungal taxa in each forest site ranged from 20 (Ojców) to 25 (Miechów) (Table 3). Sørensen similarity indices for fungal communities between sites were high with an average of 0.82 (Table 5). Most taxa were identified to species (69.0 %) or genus (18.3 %). Most species belonged to the Ascomycota (98.6 %). Only Sistotrema brinkmannii, represented by one isolate, belonged to the Basidiomycota (Table 2). The frequency of H. fraxineus ranged from 43.3 % at the Nowy Targ site to 68.3 % at the Limanowa site (Table 3). The growth rate of H. fraxineus colonies isolated from bark or wood placed on agar medium was low. However, the inhibition zone, which often formed around a colony, restricted growth of accompanying, faster-growing fungi. Colonies formed by the fungus in vitro were orange, whitish or whitish grey, sometimes with black stromatic structures. Phialospores produced on phialophores appeared abundantly, particularly after longer incubation at a low temperature (5 °C). Despite much interspecific variation, six other taxa, Alternaria alternata, Diaporthe eres, Diplodia mutila, Fusarium avenaceum, F. lateritium and Phomopsis spp., were present in more than 5 % of samples from all six forest sites (Tables 2, 3). The frequency of A. alternata differed between sites. This fungus was seven times more frequent at the Ojców site than at the Miechów site (Table 3). Diaporthe eres was the most common representative of the Diaporthe (Phomopsis) complex (Table 2). Its highest and lowest frequencies were recorded at the Nowy Targ and Limanowa sites, respectively (Table 3). In vitro, this fungus formed only its anamorphic stage, Phomopsis velata (=Ph. oblonga), which was recognizable by its two kinds of conidia: the ellipsoid alpha conidia and hamate beta conidia. The frequency of Phomopsis spp. ranged from 11.7 to 30.0 % (Table 3). The highest and lowest frequencies of D. mutila were recorded at the Gryfice and Nowy Targ sites (Table 3). Other anamorphic species represented Botryosphaeria teleomorph identified in initial necrotic lesions included Dothiorella sarmentorum and Diplodia seriata (Table 2). Among the other fungi, Aureobasidium pullulans, Lophiostoma corticola, Phoma exigua and Valsa cypri were the most frequent (Table 2). Endophytic fungi from Xylariaceae were represented by Hypoxylon serpens and two species of the genus Xylaria. Only Chaetomium globosum formed ascomata with ascospores in vitro. Other ascomycetous species did not fructify in vitro or formed only conidia. Taxa classified as Cytospora spp. and Phomopsis spp., found in 0.8 and 17.5 % of initial necrotic lesions (Table 2), need further morphological and molecular study. All the fungal taxa which occurred frequently (Table 3) were detected both in initial necrotic lesions colonized by H. fraxineus and in those from which H. fraxineus was not isolated. From 26.7 % of necrotic lesions, only H. fraxineus was isolated. Besides this, H. fraxineus was isolated together with one other fungus (from 23.6 % of necrotic lesions), with two other fungi (8.3 %) or three other fungi (0.6 %). Diaporthe eres (8.1 %), A. alternata (7.5 %), Phomopsis spp. (3.9 %), D. mutila (3.6 %), F. avenaceum (3.6 %), F. lateritium (2.2 %) and A. pullulans (1.4 %) were the most common. Only one species, i.e. Diaporthe eres (from 8.3 % of necrotic lesions), D. mutila (6.4 %), Phomopsis spp. (4.7 %), F. lateritium (3.1 %), F. avenaceum (1.7 %), A. alternata (0.8 %), V. cypri (0.5 %), L. corticola (0.3 %) and P. exigua (0.3 %), was isolated from 26.1 % of necrotic lesions where H. fraxineus was not found. Two to four fungal species presented in Table 2 were isolated from the remaining (14.7 %) necrotic lesions. There were 41 fungal taxa identified in 360 samples of dead apical parts of stems and twigs, based on the occurrence of fruit bodies and sporulation in situ (Table 2). Fruit bodies appeared on 91.2 % of samples. The number of fungal taxa from each forest site ranged from 15 (Nowy Targ) to 26 (Miechów) (Table 4). Sørensen similarity indices for fungal communities between sites were high with an average of 0.80 (Table 6). Most species belonged to the Ascomycota. They formed ascomata (25.6 % of fungi), conidiomata (64.1 %) or both (7.7 %). Peniophora cinerea represented the Basidiomycota and formed flat, crust-like fruit bodies on 2.6 % of samples (Table 2). Six taxa, Diaporthe eres, Diplodia mutila, Lophiostoma corticola, Phomopsis spp., Sirodothis sp. and Valsa cypri, were present in more than 5 % of samples from all six forest sites (Table 4). Only fungi of these six taxa formed fruit bodies on material from all six sites. The frequency of fruit bodies differed between sites (Table 4). No apothecia of H. fraxineus were observed. On eight (2.2 %) samples, on wood exposed after necrosis and disintegration of the bark, this fungus formed a pseudosclerotial plate with phialides of its anamorph, Ch. fraxinea (Table 2). The highest frequency of D. eres and Phomopsis spp. occurred at the Nowy Targ site, of D. mutila at the Gryfice site, and of V. cypri at the Jędrzejów site (Table 4). Intense sporulation of the dark-pigmented fungi, Alternaria alternata, Cladosporium cladosporioides and Epicoccum nigrum, caused black discoloration of the dead apical parts of twigs. Melanomma pulvis-pyrius, Mollisia cf. cinerea and Teichospora obducens formed ascomata on wood exposed after disintegration of the bark. Species of Neonectria occurred usually in areas with local hypertrophies or cankers. Fusarium avenaceum and F. lateritium formed sporodochia incidentally, which were absent on the initial necrotic lesions. Fusarium avenaceum was found once producing perithecia (teleomorph: Gibberella avenacea). The wood in stems colonized by Peniophora cinerea showed symptoms of white rot. There were, in total, 71 fungal taxa detected in 720 samples with initial and advanced necroses on stems and twigs (Table 1). Only 18 fungal taxa were detected in both initial necrotic lesions and dead apical parts of stems and twigs. Sørensen qualitative similarity index for both fungal communities was low (0.24), while Sørensen quantitative index was, however, relatively high (0.79). Among the more common species, A. alternata, F. avenaceum, F. lateritium and H. fraxineus were more frequent in the former and D. mutila, L. corticola and V. cypri in the latter type of sample material. Diaporthe eres and Phomopsis spp. were similarly frequent in the two types of material. Relationships between fungal community composition, for species which exceeded 5 % threshold of frequency, and forest site were graphically presented in normalized coordinates (Figs. 2, 3) as the results of correspondence analysis (CA). The analysis showed that only two directions explained the large part of total inertia 94.75 % (χ2 = 90.652) in fungal community composition at the initial necrotic stage and 83.48 % (χ2 = 102.68) inertia at the advanced necrotic stage. The greatest distances between points were observed on main direction (direction 1) which are predominant projections of the latitude (compare Fig. 1). The results of CA for the initial necrotic lesions showed that the greatest inertia in fungal community was due to D. mutila and F. avenaceum, which jointly contributed to 56.3 % of the total inertia, and characterized the Gryfice and Nowy Targ site, respectively (Fig. 2). However, the greatest effect for the dead apical parts of stems and twigs in fungal community was due to D. eres, D. mutila and Phomopsis spp., which jointly contributed to 87 % of inertia. D. eres and Phomopsis spp. showed the strong relationship to the Nowy Targ site and D. mutila to the Gryfice site (Fig. 3). This suggests geographical relatedness for each of these fungal species. The USDA database lists 308 fungal species occurring on F. excelsior (after Pautasso et al. 2013). Considering this, the detection of 71 taxa on six sites located up to 600 km apart in Poland suggests a high diversity of fungi colonizing ash stems and twigs. A similarly high diversity of fungi on ash with dieback has been recorded by others. In Sweden, Bakys et al. (2009a) identified 56 fungal taxa on shoots of 20- to 30-year-old F. excelsior trees with various dieback symptoms, and in New Zealand, Chen (2012) identified 90 fungal taxa in bark and wood or buds of symptomless twigs of 60- to 70-year-old F. excelsior. In contrast, the base of dead twigs was colonized by only 22 species in healthy, naturally pruned F. excelsior trees (Butin and Kowalski 1986). Despite the diversity of fungi, only a few species occurred with high frequency. Similar results were reported from Sweden (Bakys et al. 2009a, b). Most species that occurred commonly in this study have been found on stems and twigs of F. excelsior in various habitats (Butin and Kowalski 1986; Griffith and Boddy 1988, 1990, 1991; Lygis et al. 2005; Bakys et al. 2009a; Chen 2012; Davydenko et al. 2013). Correspondence analysis revealed significant effects of locality on the frequency of some fungi. The strongest effect was recorded at the Gryfice site, which is in the north of Poland, close to the Baltic Sea, and at the Nowy Targ site, which is in the south, close to the Tatra Mountains. Different climatic conditions at these two sites seem to be the driving force for geographical specialization in these fungi (Table 1). For example, at the Nowy Targ site, D. mutila occurred only sporadically. This was the only sampling site located in a mountain region, where annual temperatures are lowest. Since D. mutila is a mesophile, with optimal temperature requirement of 25–28 °C, it seems to avoid colder sites (Luque 1989). Rainfall was the second important factor which differentiated the climatic conditions on different sites. The highest average rainfall was recorded at the Nowy Targ site (Table 1). According to correspondence analysis, such conditions favoured Diapothe eres and Phomopsis spp. (Figs. 2, 3). Fungal community structure could be also affected by tree species composition in the stand on a particular site. Such fungi as Cryptosphaeria eunomia, Camarosporium orni, Gloeosporidiella turgida and Hymenoscyphus fraxineus are associated only or mainly with Fraxinus sp. Other fungi may occur on a few species of plants (Coleophoma empetri, Diplodia mutila, Valsa cypri) or may have very wide host range (Alternaria alternata, Aureobasidium pullulans, Cladosporium cladosporioides, Diaporthe spp., Epicoccum nigrum, Fusarium spp.). A more diverse composition of plants at a forest site could contribute to the occurrence of the wider spectrum of fungi colonizing F. excelsior. Some fungi are frequent in symptomless stems and twigs of F. excelsior as endophytes. This may therefore allow them to develop fruit bodies on necrotic lesions after H. fraxineus infection. Alternaria alternata, Fusarium spp. and Phomopsis spp. are generally reported as the most common endophytes in ash bark and wood (Griffith and Boddy 1991; Kowalski and Kehr 1992; Sieber 2007; Bakys et al. 2009a; Chen 2012). In symptomless branch bases, these three taxa were more frequent in F. excelsior than in ten other tree species examined (Kowalski and Kehr 1992). Alternaria alternata was detected in 22.9 %, Phomopsis in 51.4 % and Fusarium, which occurred exclusively in F. excelsior, in 5.7 % of branches (Kowalski and Kehr 1992). In Sweden, A. alternata was very frequent in both symptomless, healthy-looking shoots and in shoots with initial and advanced necroses (Bakys et al. 2009a). In the Ukraine, A. alternata occurred in symptomatic shoots at a frequency more than twice that in the present study, but was absent from symptomless, healthy-looking shoots (Davydenko et al. 2013). Artificial inoculation of 1-year-old F. excelsior seedlings showed that A. alternata only occasionally participates in the formation of stem necrosis (Bakys et al. 2009a). The two different fungal detection methods allowed identification of the primary colonizers, which either immediately follow H. fraxineus infection or infect the ash tree independently of H. fraxineus, and secondary colonizers inhabiting stems in the advanced disease stage (Table 2). According to the Sørensen quantitative index (0.24), the species similarity of fungi in initial necrotic lesions and on dead apical parts of stems and twigs was relatively low. One of the reasons for these community differences may be the method of isolation, which favoured fungi from inner bark and sapwood and probably missed the fungi living in the outer bark. In contrast, fruiting bodies were probably most often formed on the outer bark in dead apical parts. Hymenoscyphus fraxineus was the most frequent species in initial necrotic lesions. Its role as the main pathogenic agent of the current ash dieback epidemic in Europe has been confirmed in this and several other studies and is beyond dispute (Kowalski 2006; Kowalski and Holdenrieder 2009b; Bakys et al. 2009b; Husson et al. 2011; Kirisits et al. 2012; Gross et al. 2014). The necrotic lesions formed in the initial stage of disease on twigs and young side branches were typical, and similar to those described for H. fraxineus after natural infections (Kowalski and Holdenrieder 2008) and artificial inoculations (Kowalski and Holdenrieder 2009b; Bakys et al. 2009a, b). Detection of H. fraxineus in only 59.2 % of lesions is likely to have had a number of causes, including its slow growth and antagonistic activity of other colonizers of the lesions, which were able to compete successfully for nutrients and space or acted through antibiosis. Hymenoscyphus fraxineus grows slowly and, on artificial media, seems to survive through production of fungistatic viridin, which inhibits the growth of accompanying fast-growing fungi (Grad et al. 2009). The relationships between fungi identified on stems in situ are not well known. Successful competition by the accompanying fungi, in situ, may eliminate or inhibit growth of H. fraxineus on artificial medium in vitro. Moreover, successful isolation of H. fraxineus depends on the age of the necrotic lesion. In the host tissues killed by the pathogen, the opportunistic fungi may develop more rapidly (Gross et al. 2014). After artificial inoculation, H. fraxineus was re-isolated from 100 % of lesions after 2 months and from 71.4 % of lesions after 12 months (Kowalski and Holdenrieder 2009b). After natural infection, the pathogen was isolated from 88.7 % of initial lesions and from 29.5 % of advanced necroses (Kowalski 2009). Failures in isolation of H. fraxineus after natural infection from advanced necroses have also been reported elsewhere. In Sweden, H. fraxineus was detected only occasionally in both initial and advanced necroses after natural infection (Bakys et al. 2009a), and it was recorded in only 17–64 % of lesions depending on the habitat (Bengtsson et al. 2014). In Ukraine, H. fraxineus was detected only in 5.6 % of symptomatic shoots (Davydenko et al. 2013). In the context of the latter, it must be emphasized that the age of necrotic lesions described in our paper as ‘initial’ is not known. Considering their visually recorded appearance in the sampling period, i.e. in May–June, we presume that they had been formed after the completion of the previous year’s annual growth. The necrotic tissues were not sunken in comparison with the surrounding tissues. The reasons presented above might have contributed to the rather low isolation success of H. fraxineus. The low rate of isolation of H. fraxineus suggests that other factors may be involved and contribute to the formation of necroses. Husson et al. (2011), who detected Hymenoscyphus species in 80 % of symptomatic F. excelsior samples using molecular methods and Hymenoscyphus-specific PCR primers, concluded that the remaining 20 % of lesions may have been the result of damage by abiotic factors or infection by other pathogenic fungi. Previously, before the invasion of H. fraxineus, similar lesions on branches and stems of ash trees could be caused by Hysterographium fraxini (Zogg 1944; Prihoda 1982; Cannon 1999). This fungus has not been recorded during current H. fraxineus epidemics either in Poland (Kowalski 2001; Przybył 2002; Kowalski and Łukomska 2005; Kowalski and Czekaj 2010) or in Sweden (Bakys et al. 2009ab). In Ukraine, H. fraxini was detected in only 5.6 % of symptomatic shoots (Davydenko et al. 2013). The present and previous studies show that symptomatic F. excelsior shoots may be colonized by Fusarium spp., more often by F. avenaceum and F. lateritium and less often by F. solani (Przybył 2002; Kowalski and Łukomska 2005; Ioos et al. 2009; Bakys et al. 2009a; Davydenko et al. 2013). Fusarium lateritium is well known on F. excelsior in association with Pseudomonas savastanoi pv. fraxini, the causal agent of the bacterial ash canker (Riggenbach 1956). Infection of ash twigs by F. lateritium may also start from dead buds colonized by the ash bud moth, Prays fraxinella. Colonization may result in the formation of smooth red-brown swellings on the stems, with small cracks at their margin (Janse 1981). Fusarium lateritium is also one of the main primary colonizers of the superficial tissues of living and dead ash twigs (Griffith and Boddy 1991). The high frequency of Fusarium species, particularly in symptomless ash tissues, may result from elimination of other fungal colonizers by production of antifungal metabolites (Riggenbach 1956; Griffith and Boddy 1991; Lysøe et al. 2014). Studies on F. avenaceum and F. lateritium did not provide any evidence for their pathogenicity to F. excelsior (Bakys et al. 2009a). Diaporthe (anamorph: Phomopsis) species have often been reported as plant pathogens, non-pathogenic endophytes or saprobes, commonly isolated from a wide range of hosts (Kowalski and Kehr 1992; Sieber 2007; Gomes et al. 2013). They produce lignocellulolytic enzymes and interesting secondary metabolites with antibiotic activity (Gomes et al. 2013). Although H. fraxineus is an invasive fungus, it does not eliminate Diaporthe/Phomopsis from the ash stems and twigs on which the latter produces fruit bodies. It can be concluded that H. fraxineus, by causing early necrosis, favours colonization and fructification by Diaporthe. It is so far impossible to state if this situation allows the Diaporthe a chance to increase the size of necrotic lesions. This depends on specialization and adaptation in Diaporthe/Phomopsis. Some species of this complex can be therefore either harmless endophytes or pathogenic depending on the host health status (Uecker 1988; Gomes et al. 2013). Diaporthe/Phomopsis fungi have often been classified as host specific (Udayanga et al. 2011; Gomes et al. 2013). Species recorded so far on Fraxinus included mostly Ph. controversa, Ph. platanoidis and Ph. scobina (Butin and Kowalski 1986; Griffith and Boddy 1988, 1990; Przybył 2002; Kowalski and Czekaj 2010; Gomes et al. 2013). Recent studies have shown, however, that although some Diaporthe species are host specific, a great number of species are able to colonize diverse hosts (Gomes et al. 2013). Diaporthe eres is the species currently found most often on diseased ash trees. It can live as a pathogen, endophyte or saprotroph and has a widespread distribution and broad host range (Udayanga et al. 2014). In some regions, it is considered an important pathogen with significance in plant health inspection and quarantine (Cline and Farr 2006; Udayanga et al. 2014). Diplodia mutila (teleomorph: Botryosphaeria stevensii) is an ascomycetous fungus from the Botryosphaeriaceae with worldwide distribution (Alves et al. 2014). A wide host range has also been reported (Sutton 1980). Recently, however, confirmed hosts of D. mutila have included only Chamaecyparis lawsoniana, Fraxinus spp., Malus spp., Populus spp., Taxus baccata and Vitis vinifera (Phillips et al. 2013; Alves et al. 2014). Molecular characterization of Polish isolates of this fungus were reported by Kraj et al. (2013), who showed that isolates of D. mutila from F. excelsior in Poland were genetically very similar to isolates from other regions of the world. The close similarity of all isolates from F. excelsior indicates the possibility of host specialization in the fungus. Kraj et al. (2013) also showed that isolates from F. excelsior were phylogenetically quite distant from isolates from F. angustifolia. Alves et al. (2014) showed that isolates of D. mutila from F. angustifolia differed genetically and morphologically and the fungus was designated as Diplodia fraxini. In Europe, D. mutila was not recorded among frequent colonizers of F. excelsior before H. fraxineus appeared (Sutton 1980; Butin and Kowalski 1986; Griffith and Boddy 1988). Ten years after the appearance of H. fraxineus in Poland D. mutila was still detected only rarely, although it was widely distributed (Przybył 2002). It has now become more frequent on ash trees with dieback symptoms in Poland (Kowalski and Łukomska 2005; Kowalski and Czekaj 2010) and other countries in Europe (Lygis et al. 2005; Cech 2006; Bakys et al. 2009a; Gross et al. 2014). The present results confirm earlier studies. It seems that H. fraxineus may increase the susceptibility of F. excelsior to colonization by D. mutila. Przybył (2002) confirmed the pathogenicity of D. mutila on 2-year-old F. excelsior saplings. Therefore, it cannot be discounted that D. mutila contributes to the enlargement of necroses primarily caused by H. fraxineus or may cause separate necroses. The latter would explain the absence of H. fraxineus in some of the initial necrotic lesions that were analysed. Since D. mutila requires relatively high (25–28 °C) temperature, global warming may increase its pathogenic role in ash stands (Luque 1989; Thompson et al. 2010). Lophiostoma corticola (syn: Massarina corticola) has wide host and geographical range (Bose 1961; Farr et al. 1989; Liew et al. 2002; Chen 2012). It was not recorded in previous studies of ash twigs (Butin and Kowalski 1986; Griffith and Boddy 1988, 1990, 1991). Currently, it is found frequently on ash. In the Ukraine, this fungus was detected in litter, in ash petioles from the previous year (Davydenko et al. 2013). It was also detected in ash wood in Slovenia (Gherghel et al. 2014) and in the bark and buds of living ash branches in New Zealand (Chen 2012). The present results suggest that its frequency increases in stems and twigs with advanced necrosis, which categorizes the fungus rather as a secondary invader or saprotroph. Valsa cypri (anamorph: Cytospora pruinosa, Cytophoma pruinosa) occurs in Asia, Europe and North America on plants of the family Oleaceae, including Fraxinus, Ligustrum, Olea and Syringa, and also of the families Moraceae and Celtidaceae (Spielman 1985; Farr et al. 1989; Hayova and Minter 1998; Fotouhifar et al. 2010). This fungus was often found on deteriorated white ash trees (F. americana) in USA (Silverborg and Brandt 1957; Ross 1964). Ross (1964) concluded that such trees must first have been predisposed to infection by the fungus and that the predisposition could have resulted from drought. Since V. cypri occurred rarely in initial necrotic lesions but frequently in dead stems and twigs, it may be assumed that the predisposition can also result from earlier infection by H. fraxineus. Pleurophoma pleurospora and Sirodothis sp. are other species that seem to benefit from prior infection by H. fraxineus. Both fungi occurred more frequently in stems and twigs with advanced necroses. The former (anamorph: unknown) occurs on branches and bare wood of trees and shrubs (Sutton 1980; de Gruyter et al. 2010). The latter is an anamorph of the discomycetous genus Tympanis (Johnston et al. 2014). Among the species that occur less frequently on ash trees, Nectria cinnabarina, Neonectria coccinea, N. galligena, Phoma exigua and Valsa ambiens are known to be pathogenic on ash (Sinclair and Lyon 2005a, b; Schmitz et al. 2006). Further pathogenicity tests are needed to establish the role of particular fungal species in the pathogenesis of ash dieback. The significance of colonized organs as reservoirs of inoculum for ash and other tree species also needs to be studied. In such studies, emphasis should be placed on the most frequent species of fungi, including D. mutila, Diaporthe spp., Fusarium spp. and V. cypri. Since H. fraxineus does not form fruit bodies on symptomatic ash stems and twigs, there is no threat of dissemination of the pathogen from these ash tissues. Ash dieback has implications for fungal biodiversity. In the short term, some initial or secondary fungal colonizers may benefit from earlier infection of F. excelsior by H. fraxineus. In the long term, however, the possible extinction or drastic reduction of the European ash population will cause changes in the habitat followed by decrease in occurrence of ash-specific fungi (Pautasso et al. 2013). Changes in biodiversity will include not only the fungi. Occurrence of ash dieback may also affect other organisms associated with or dependent on European ash (Jönsson and Thor 2012). Details of fungal occurrence on ash trees with symptoms of dieback are reported. The results showed that, in necrotic ash tissue, numerous fungi may occur, although only a few species were very frequent. Mycological analysis, by classical isolation of fungi from ash stems and twigs with initial necrotic lesions, confirmed H. fraxineus as the main causal agent of the current epidemic of ash dieback. Failure to detect the pathogen in some samples may have resulted from difficulties associated with isolation on artificial media or from the pathogen’s absence in necroses caused by other fungi. A large group of fungi appear to benefit from prior infection of ash trees by invasive H. fraxineus. Symptomatic stems and twigs were often colonized by fungi that occurred less frequently in the early stages of ash diseases in the past, before the current H. fraxineus epidemic. This group includes the endophytes Alternaria, Fusarium and Diaporthe (Phomopsis), and the facultative parasite Diplodia mutila, which infect ash in favourable conditions. Hymenoscyphys fraxineus did not form apothecia on dead apical parts of stems and twigs confirming that these plant tissues do not contribute to the reservoir of inoculums of H. fraxineus. The sporadic occurrence of the anamorph stage of H. fraxineus, Chalara fraxinea, on dead stems is not significant for disease development because conidia are not able to infect. Fungi that formed fruit bodies most frequently on the dead apical parts of stems and twigs were: Diaporthe eres, Diplodia mutila, Lophiostoma corticola, Phomopsis spp., Sirodothis sp. and Valsa cypri. Some of these are facultative parasites, therefore leaved in the forest of dead ashes which are well colonized by the mentioned fungi may represent a noticeable threat to young or stressed and weakened ash trees, or even to other tree species since some of the fungi species possess broad host spectrum. Research was conducted between 2012 and 2015 as part of a project supported by the National Science Centre, decision no. DEC-2011/03/B/NZ9/00078. The authors express their gratitude to the Heads of Forest Districts and Ojców National Park for their help during research. We thank Krzysztof Leszczyński for his help with statistical analyses and two anonymous reviewers for constructive comments on the manuscript.